The guest house's interior elements, such as shelves, stairs, sliding doors, and decor, are kept in their original state so as to retain the unique atmosphere of the Edo and Meiji period. 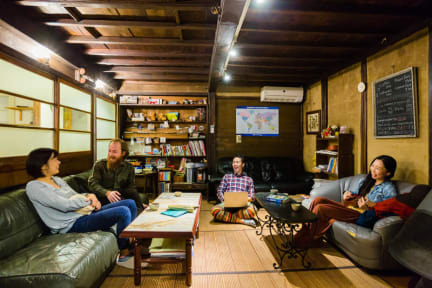 Here is an ideal place for those looking to lodge at a hostel full of traditional Japanese charm!!! We invite our guests to relax in our cozy lounge, enjoy meeting to other guests from all over the world, and our neighbors. If you are going on a long journey, just stay and make yourself at home here. We are always happy to help you whatever you need. Cherry blossom in Suzaka during spring, barbecue or camping in the yard during summer, water fall amidst autumn leaves, and Snow Monkey park and skiing or snowboarding during winter. We are located in a rural town, Suzaka City in Nagano. 2 minutes to convenience store, Lawson. You will find many local restaurants within walking distance from our Guest House, like Japanese Soba restaurant, local sake bar, ramen shop, katsudon (pork cutlet on rice) shop and more. It runs between Nagano Sta. and Yudanaka Station (nearest station for Snow Monkey Park). And Suzaka sta. is in the middle of this line. Cafe La Vie Lente is open from 8:00 to 23:00. Cafe is located at the entrance of the Guest House KURA. Also available coffee, espresso, ginger tea, and more. We have 3 types of rooms, private room, male dorm, and female dorm. All rooms are Japanese Tatami rooms with an intimate atmosphere. If you want to leave your luggage before check-in, please inform us in advance. + We accept credit card. Payment are expected on arrival.